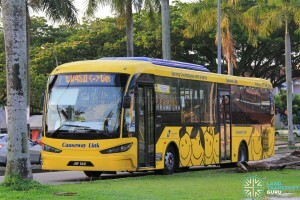 Causeway Link CW4S is a cross-border service operated by Malaysian bus operator Handal Indah (Causeway Link), plying between Jurong East Bus Interchange and Sutera Mall in Johor, Malaysia. Crossing the border via the Tuas Second Link, the route serves the towns of Taman Ungku Tun Aminah (TUTA) and Gelang Patah, via Gelang Patah Bus Terminal en-route. 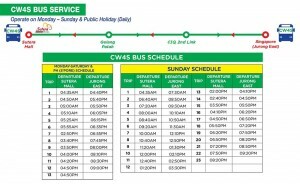 Service CW4S has a unique operating pattern, only operating during the mornings and evenings on Mondays-Saturdays and Singapore Public Holidays. On Sundays, it operates throughout the day. In addition, some buses from Jurong East terminate at Gelang Patah rather than continue to Sutera Mall. CW4S shares its Gelang Patah – Jurong East sector with Services CW3 and CW4. Notes Operates on a complex schedule staggered with other services. Detailed schedule below. 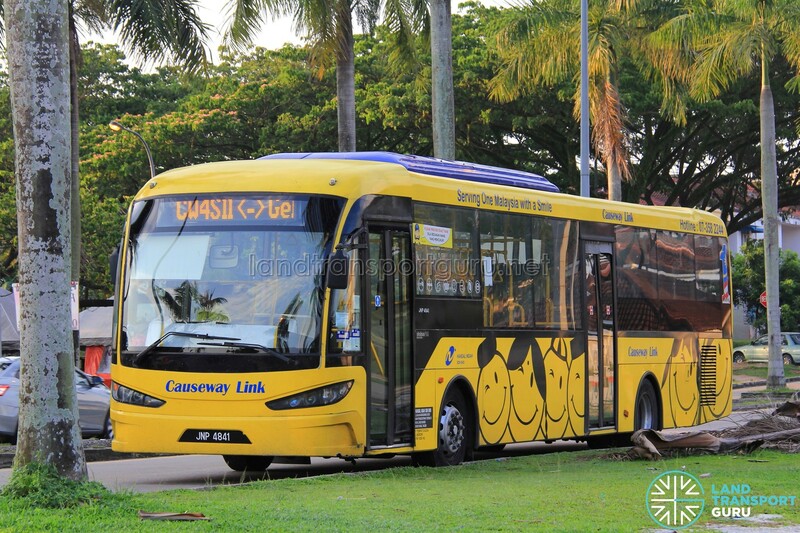 Service CW4S is a cross-border route connecting the Taman Ungku Tun Aminah (TUTA), Taman Sri Orkid, Lima Kedai and Gelang Patah areas in Johor with Jurong East Bus Interchange in Singapore, via the Tuas Second Link crossing. The route is one of five regular cross-border bus services operating via the Tuas Second Link, along with Service CW3, CW4, CW6 and CW7. 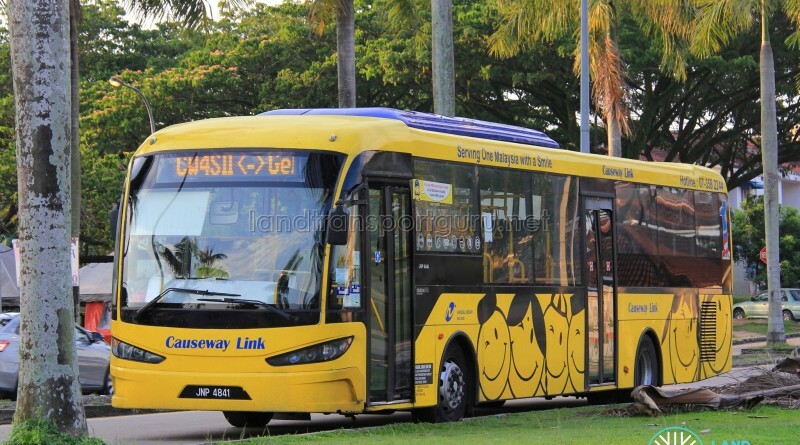 Second Link plying CW services, inclusive of CW4S, operate as public bus when operating in Johor sector, stopping at all en route bus stops along their route. It effectively serves residents of flats along Taman Ungku Tun Aminah, Taman Seri Orkid, Mutiara Rini, Mutiara Mas, and Nusa Perintis. Because CW4S does not serve these residential areas from Gelang Patah towards Sutera Mall (plying express to Sutera Mall instead), passengers will have to alight at Gelang Patah Bus Terminal and change to Bus 666 (details below, at Transfer to other bus services section). Service CW4S has a unique operating pattern, only operating during the mornings and evenings on Mondays-Saturdays and Singapore Public Holidays. In addition, some buses departing CIQ Second Link may terminate at Gelang Patah rather than continue to Sutera Mall. It is advised to inform the bus drivers and ground timekeepers if one intends to head for Sutera Mall. On Sundays, CW4S operates throughout the day. 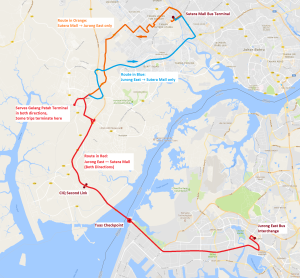 Second Link-plying CW services, inclusive of CW4S, do not stop at any bus stops in Singapore except the designated boarding point at Jurong East. Due to varying traffic conditions at the Tuas Second Link, travel times and waiting times may increase significantly when traffic congestion occurs. Sutera Mall (before 6am): Bus terminal along Jalan Sutera Tanjung 8/1, near the junction with Jalan Sutera Danga. With a valid ticket at Tuas Second Link, passengers travelling towards Jurong East can similarly board CW3 and CW4, board CW6 for Boon Lay, or board CW7 for Tuas Link. Alternatively, passengers heading towards other destinations in JB can transfer to other bus services at CIQ Second Link. Passengers arriving from Singapore may travel for free on Causeway Link’s Service 666 from Gelang Patah to Larkin Sentral. The ticket or ManjaLink card must be produced on request. The transfer point is the pair of bus stops along Jalan Gelang Patah, between Persiaran Nusa Perintis and Jalan Nusa Perintis. Note that a fare top-up of RM4.80 at Gelang Patah may be required when continuing from Singapore to Pontian. Fares for travelling between towns along JB sector are usually around RM1.50 – RM3.00. More detailed fare information for Manjalink users is attached in a separate section below. Note: Green denotes roads in Singapore, Blue denotes roads in Johor Bahru, Malaysia. Red indicates major transfer stops.